Contact Fiona at Brickyard Farm Cottages on 01934712703 (mobile: 07515331261) or complete the enquiry form. Searching for a romantic hideaway in the scenic Somerset Levels? If so, choose from two lovely romantic retreats at Brickyard Farm, just 5 minutes' walk from the tranquil village of Wedmore and 5 miles from Cheddar. Set in the scenic Somerset countryside, each of these couple's cottages has been beautifully decorated and offers ample rural charm. Both cottages benefit from Wifi internet access. With beautiful country views from the bedroom and lounge out across the fields to the Mendip Hills, Ian's Cottage is a lovely rural retreat. • A cosy lounge with a warming woodburner, TV and dining table. • A pretty romantic bedroom with a king-sized bed. • A kitchen with electric cooker, coffee machine, washing machine and microwave. • A bathroom with bath (shower over), hand basin and WC. Outside is a lovely table where you can sit out and enjoy a morning coffee or an evening glass of wine whilst soaking up the glorious rural location. • an open plan living area with a comfy sofa set by a warming open fire and TV, a romantic dining area set next to French doors that open out to the terrace and a well equipped kitchen with electric cooker, microwave, coffee machine, washing machine and dishwasher. • a mezzanine bedroom area with double bed. • a bathroom with bath (plus shower over), hand basin and WC. Outside is a tranquil terrace where you can dine alfresco and really make the most of this beautiful rural location. 25% deposit required. Balance due 6 weeks before holiday commences. Full payment due within 2 days for bookings made less than 6 weeks in advance. Garden: Ian's Cottage has a private lawned garden Wilf's Barn has a gravelled outside area, both have garden furniture. 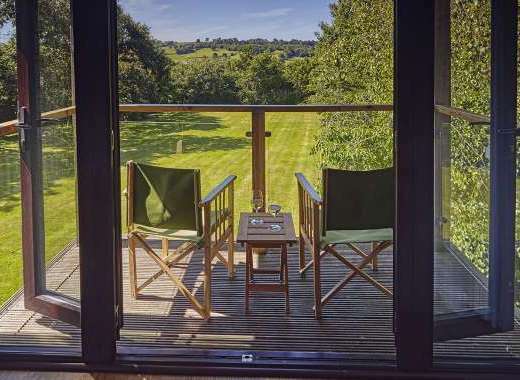 Ian's Cottage has country views across the fields to the Mendip Hills. April short break at Murmur Aeron - 4 nights Tuesday 23rd April now available for £324 Includes WiFi - Detached with large garden and garage - Local pub, shop and cafe in village a short walk away.